I was flicking through the channels one day and stopped briefly on HSN when they were discussing this product. Of course, being a makeup addict, I had to stop and watch for a few minutes. 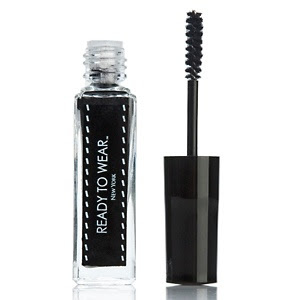 I was so interested by this mascara that I decided to give it a try and order it! I am generally really happy with the results! This is a very unique product in that it uses fibers that bond to your lashes instead of a liquid substance like regular mascara. I wouldn't normally spend over $20.00 on a mascara (drug store brands seem to work great for me), but this really is a neat product for building full and long lashes! Application: Apply one coat of your regular mascara, a few coats of the Lash Extension, and another coat of mascara to seal the fibers on your lashes. Negatives: Lashes may appear a bit clumpy after using this product. Also, the fibers will fall onto your cheeks. They do not smear as a regular mascara would, but the fibers may stick to your foundation or face lotion and become difficult to remove. I would recommend holding a tissue underneath your eye when you apply this. The pictures show an eye with one coat of regular mascara, and then after using Lash Extension and also a comparison shot with both eyes. Bummer- I can't wear fiber-based mascaras with my contacts, but I've found that DiorShow does wonders for my lashes with or without contacts in. I know you said you won't spend more than 20 for mascara, but it's actually the only thing I do justify spending $ on (other than foundation) now that I've fallen in love with it! Really, i will have to check that out bc your lashes always look awesome! I will definitely be looking into that mascara!